Are you having problems with your Wi-Fi on Windows 10? 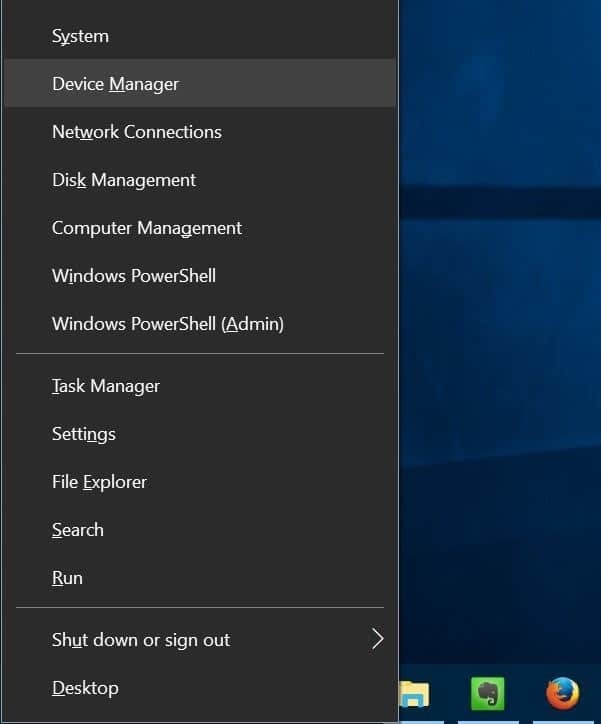 Is your Windows 10 PC unable to connect to Wi-Fi networks? In this guide, we will see how to fix common Wi-Fi issues by reinstalling the Wi-Fi driver. On your Windows 10 PC, you might encounter issues while connecting to a Wi-Fi network. Your PC might not detect available Wi-Fi networks or fail to connect to a wireless network. At times, the Wi-Fi adapter might refuse to turn on or off. Most of the Wi-Fi related issues on your PC can be fixed by reinstalling the Wi-Fi driver on your PC. Reinstalling the wireless driver includes downloading a fresh copy of the driver, uninstalling the current driver from your PC and then installing the fresh copy of driver. 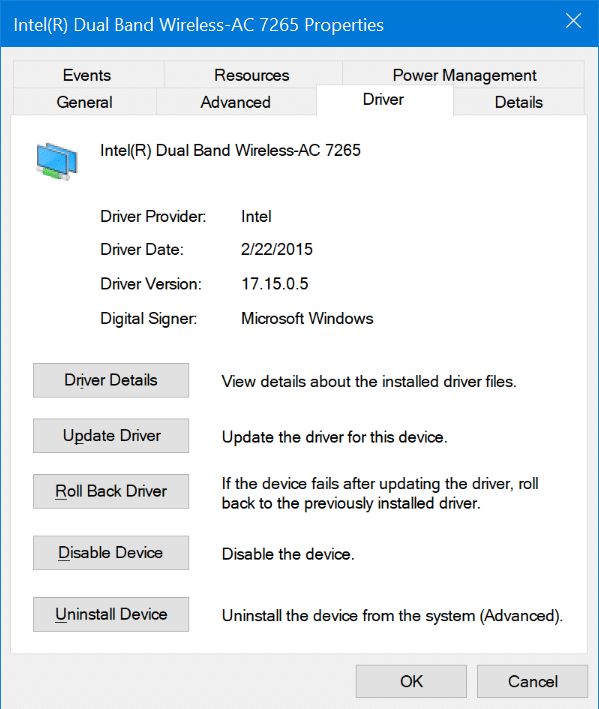 Complete the given below directions to reinstall the wireless or Wi-Fi driver on your Windows 10 PC. IMPORTANT: When you reinstall the Wi-Fi driver, Windows will delete all saved Wi-Fi network passwords. That means, after installing the Wi-Fi driver, you will have to enter the password again to connect to a wireless network. If you have forgotten the Wi-Fi password, please refer to our how to view saved Wi-Fi password in Windows 10 guide to back all Wi-Fi passwords before uninstalling the driver. Step 1: Open Device Manager. To do so, right-click on the Start button and then click Device Manager. 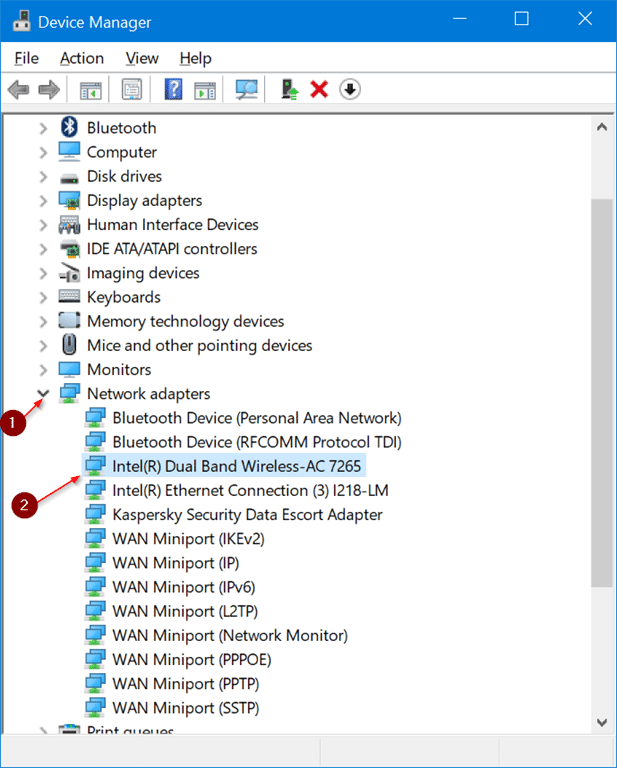 Step 2: In the Device Manager, expand Network Adapters to see all network adapters, including the wireless adapter. The Wi-Fi adapter usually has the term “wireless” in its entry. Note down the wireless adapter name and number as you will need to download the adapter driver before uninstalling the present driver. 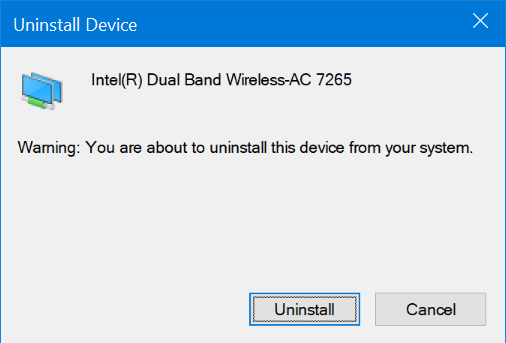 Once you uninstall the present wireless driver, your Wi-Fi adapter will stop working, so you cannot download the new driver unless you have an Ethernet connection. 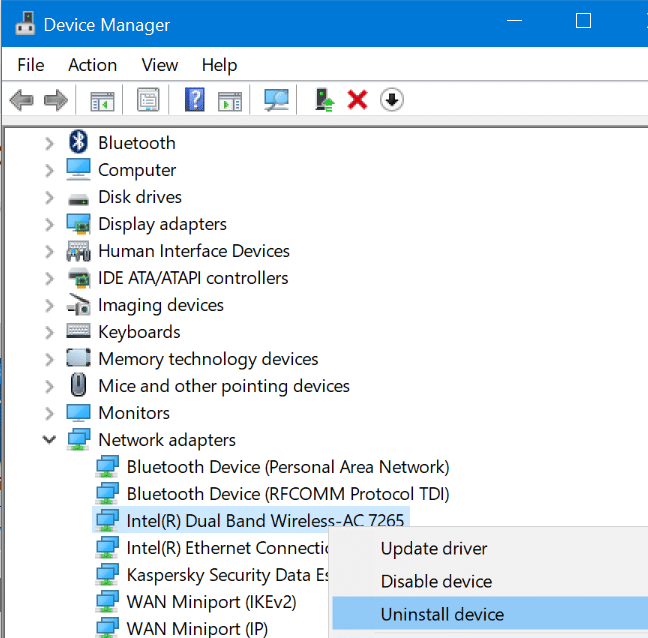 To check the version number of the driver, right-click on the wireless driver entry in Device Manager > Network adapters, click Properties, click Driver tab. Step 3: Visit wireless adapter’s official website or your PC manufacturer’s website, and download the right Wi-Fi driver. We repeat, make sure that you have downloaded the right wireless adapter driver. 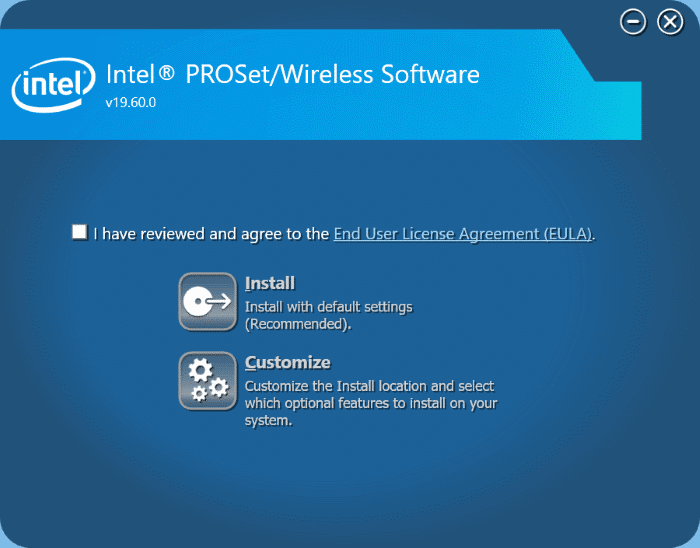 Step 4: In the Device Manager, right-click on the wireless adapter entry, and click Uninstall device option. In older versions of Windows 10 (build 10240), you will see only Uninstall instead of Uninstall device option. Step 5: When you see the following confirmation dialog, please click Uninstall button to uninstall the driver as well as the device. Step 6: Once the driver is uninstalled, save your work, and restart your PC once. Please reboot your PC once to avoid driver issues later. Step 7: Launch the setup of the new driver that you downloaded previously (as mentioned in Step 3), and follow the on-screen directions to install the driver. That’s it! If asked, perform a reboot to complete the driver installation. You can now click on the Wi-Fi or wireless icon on the taskbar to see all available wireless networks. If the icon is missing, please refer to our fix to wireless icon missing from Windows 10 taskbar guide. Also learn how to delete old drivers in Windows 10. I have made the mistake of deleting the (old) wireless adaptor, before trying to download the updated version, which I cannot do because I am offline. 3DP cannot, of course, find the old adaptor, and so states that it cannot update it. Can it be persuaded to install the new wireless adaptor in the blank space of the old one, please? I believe Windows Defender removed all wifi drivers from my computer. WD recognized a threat and executed an action. Now I have no wifi drivers whatsoever. I can’t replace the drivers because they cannot be updated. Please help! You state ensure you have downloaded the ‘right’ wireless adapter drive….I can’t get on the bloody internet which is why I’m here….. I have lost 13 years worth of photos my daughters birth precious moment and because of your incompetence and you wonder why people move to other providers….Not to mention the Work issues this has cause as a Home worker…….idiots absolute idiots. If you wondering how I’m sending this I’m now on an Apple iPad….not throug choice through necessity. I would like to find out if I have a custom assembled PC without knowing what brand those parts are from, how can I search within the computer in order to download the right driver? Will I be able to find out what I am using by searching the PC? My home WiFi is not seen in the WiFi list in my Dell laptop with Windows 10 .But it is working in all other devices like mobiles and notepads . What is the problem ?